In Europe and the US, online video is dominated by premium subscription services like Netflix, Hulu, and HBO Now. But western TV is also popular in China, where these streaming channels don’t exist. China has its own video sites with licensed content, and most of it is free to watch. Chinese video sites rely on advertising as opposed to paid subscriptions for revenue and offer as much as they can for free in order to gain market share in a country where thousands of people gain internet access for the first time every day. Their business model means tons of free content, both from the west and the east. Online video is fragmented between a handful of websites in China, the major contenders being Youku Tudou, iQiyi, LeTV, Sohu, PPTV, Baidu Video, and QQ Video. Each has forged partnerships with Hollywood studios and other western content distributors. All you need to access Chinese video streaming sites is a web browser and a VPN. 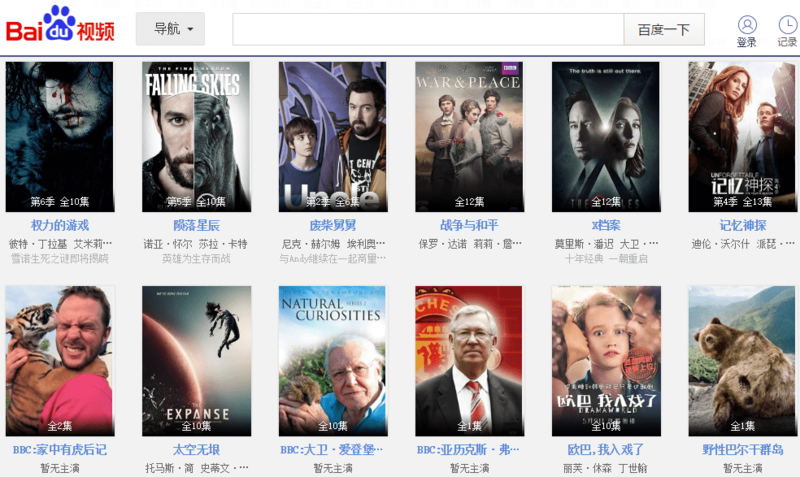 You can either search for a TV show or movie on Baidu, China’s most popular search engine, or on the video site itself. Searching in English might return results for what you’re looking for, but searching in Chinese is usually a better option. To find the Chinese name of a show or movie, type the English name into Baidu. The Chinese name often shows up in search results. If not, one of the search results should be a Wikipedia-type page (Douban.com or Baidu Baike) containing both the English and Chinese titles. Chinese titles are typically four characters long, give or take a character. For example, Orange is the New Black in Chinese is 女子监狱. Copy and paste the Chinese characters into the search bar on the site of your choice. You may end up with a lot of short video clips and trailers, so filter or organize by runtime if you can. Longer videos are more likely to be full episodes and full-length movies. TV shows are normally organized into playlists of entire seasons. Once you find the video you want, be prepared for advertisements. Western ad blockers often don’t work on Chinese advertisements. Ads will pop up abruptly in the middle of a video. Most western content contains the original English audio and Chinese subtitles. Children’s shows and movies and anime, however, are more likely to be dubbed in Chinese. If you receive an error message like this one when trying to watch a video, the content is probably geo-restricted to users in China. Depending on what you want to watch and what country you’re watching from, you might need a VPN. VPNs allow you to route your traffic through a server in a location of your choosing, making it look to the destination website as though you are in another country. A wealth of VPNs used by people in China can circumvent the country’s censorship system, known as the Great Firewall, to access blocked apps and websites. But far fewer reputable VPN services can be used to tunnel into China and speeds fast enough and reliable enough for streaming. PureVPN has servers on the mainland. Sign up, download, and install the VPN software. Choose one of the servers in mainland China (not Hong Kong or Taiwan) and connect to it. Clear your cookies, then reload the video. You should now be able to watch with the VPN enabled. Deal alert: PureVPN is currently offering a massive discount on it’s 2 year plan there’s a 7 day money-back guarantee so you can try it risk free and get a refund if it’s not for you. Which Chinese video site has the show I want to watch? Some TV shows can be found across multiple Chinese video streaming sites, and others are exclusive. Searching for something in Baidu is probably the easiest option to find what you want.